Valentine's Day is right around the corner. Today Kayla and I will decorate the goody bags for her class party. If they come out right I will post them. I am in the process of working on Kayla's 4th year book. I hope to have it completed before her birthday. I want to give to her as a birthday gift. She loves her photo books. She usually goes to the bookcase and looks at them once every few weeks. 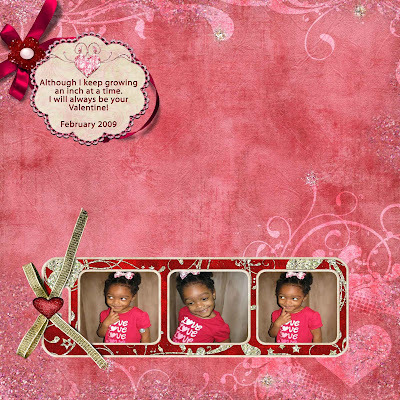 Below is one of the photo book pages for February. I used Mood For Love Collab With Microferk - The Kit By Phuong. You can pick at the kit at Scrapbookgraphics.